The US Republican Party is dead; long live the GTP. No there is absolutely no mistake there and GOP died aside with the rest of the Republican Party, no USA has GTP, the Grand Trump Party where the word ‘party’ can also translated as a social gathering of invited guests, preferably rich, involving eating, drinking, and funding despicable and anachronistic often Medieval causes. In a tragic irony the members and the representatives of the Republican Party in the Capitol Hill have fulfilled all the stereotypes that want a good republican to be a self-cantered corrupted politician who works for his/hers personal (and family’s) enrichment and he/she doesn’t give a damn for anything further than their personal interests. Always in the pocket of some strong industrialist, always helping a banking and construction industry to laundry money, always conspiring for ideals that spread fear and prejudice. 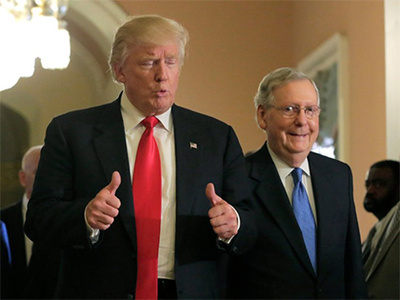 Ladies and gentlemen, the party of Abraham Lincoln, 16th President of the United States and the first Republican President, long live Donald Trump and …Mitch McConnell. Originally, the GOP subscribed to what is referred to as classical liberalism with ideological stands that were anti-slavery and pro-economic reform. In the 20th century GOP's political platform supported lower taxes, free market capitalism, free enterprise, a strong national defence, gun rights, deregulation and restrictions on labour unions. Today. GTP has no platform but Trumpism: taxes only for the poor, xenophobia, racism, market protectionism, enrich the rich, enrich Trump enterprises, strengthen NRA because they find well Trump, kill any kind of labour movement, return to slavery without prejudice. Actually today’s ideological platform and practice of the Republican Party aka GTP is: empower and enrich Donald Trump. Pay attention, not the US presidency or the 45th President of USA but Donald Trump. The founding Republican ideology was reflected in the 1856 slogan "free labour, free land, free men", which had been coined by Salmon P. Chase, a Senator from Ohio (and future Secretary of the Treasury and Chief Justice of the United States). "Free labour" referred to the Republican opposition to slave labour and belief in independent artisans and businessmen. "Free land" referred to Republican opposition to the plantation system whereby slave owners could buy up all the good farmland, leaving the yeoman independent farmers the leftovers. The party strove to contain the expansion of slavery, which would cause the collapse of the slave power and the expansion of freedom. Donald Trump and his GTP represent everything this first Republican Party slogan stands for and if you need any proof just follow the news, minor the state controlled station Fox News. Do you want more GOP irony? Republican President Theodore Roosevelt – the one Trump admires so much - was a prominent conservationist whose policies eventually led to the creation of the National Park Service, the one Trump tries to abolish. While Republican President Richard Nixon whilst not an environmentalist, he signed legislation to create the Environmental Protection Agency in 1970 the one Trump abolishes. And while the list of Trumpism fighting and destroying Republicanism is endless little would have happened if GOP hadn’t become GTP and Mitch McConnell with Paul Ryan the speakers and representatives of the GTP non-ideology. What is left to the majority of the Americans who didn’t vote for him but have to live with him due to electoral trick and the Americans who realized that the man is the enemy of USA are the midterm elections, hoping democrats and republicans that they can take the power from the GTP and somehow control an erratic president. What a sad end for Abraham Lincoln's party!